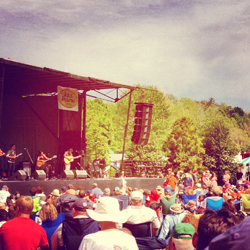 Merlefest is an annual four-day traditional and contemporary roots music festival featuring bluegrass, folk and Appalachian roots music from across the country. Happening this year from April 25- 28, 2019, Merlefest takes place on the campus of Wilkes Community College in Wilkesboro, North Carolina, and is a favorite of thousands in the area. Originally hosted by folk music legend and Grammy Award-winner Doc Watson until his passing in 2012, Merlefest was named after Doc’s late son, Eddie Merle Watson, who died in a tragic tractor accident. This will be the first MerleFest since Doc Watson’s death. The 2019 Merlefest lineup consists of more than 100 artists performing across 13 stages, including The Avett Brothers, Brandi Carlile, Amos Lee, Wynonna Judd & the Big Noise, Keb’ Mo’, Tyler Childers, The Milk Carton Kids, The Earls of Leicester, Sam Bush Band, Dailey & Vincent, Peter Rowan and The Free Mexican Airforce, Jim Lauderdale, The Black Lillies, Donna the Buffalo, and so much more. In addition to world-class music, the Festival offers a large children’s activities area, called “Little Pickers Family Area,” a student showcase for children, “Pickin’ Place” for any musician to join in and jam, the Songwriters Coffeehouse, a Nature Walk, crafters and over 70 vendors to shop from. Camping and RV area available at nearby River’s Edge Campground. Ticket prices range from $70-$90 Single Day Passes to $185-$285 Multi-Day Passes with early bird discounts before February 17, 2019. Children 12 and under are FREE in the general admission seating areas, however, tickets are required for everyone in the reserved seating area. A Rivers Edge camping package and backstage tour are also available as add-ons at an additional cost. Purchase tickets at www.merlefest.org. Proceeds from the Fest benefit Wilkes Community College. 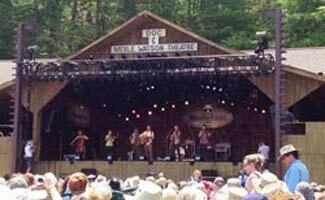 Who is your favorite act you’ve ever seen at Merlefest?